Heinz Reignites Debate: Is a Tomato a Fruit or Vegetable? PITTSBURGH & CHICAGO--(BUSINESS WIRE)--Apr. 5, 2018-- In celebration of National Tomato Day on April 6, Heinz is reigniting a critical debate that’s plagued the nation and bewildered eaters for decades: is the tomato a fruit or a vegetable? Scientists assert that botanically speaking, a tomato is a fruit. In 1893, an obscure U.S. Supreme Court tariff case declared that a tomato is in fact a vegetable. Ask mostchefs, and they’ll tell you the same. Will we ever come to a meeting of the minds? Heinz is rekindling this dispute with an entertaining video that highlights the question that the public has grappled with over the years. The brand is encouraging the nation to join the debate and choose a side by casting their vote at thetomatodebate.com or by using #tomatodebate on Twitter and Instagram by April 8. Heinz will also be selling a limited quantity of Heinz Ketchup made from Tomato Fruits -- and Heinz Ketchup made from Tomato Vegetables -- for the most passionate on either side. 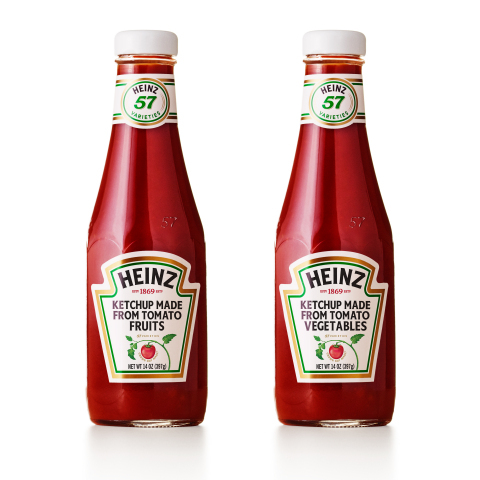 The poll results will decide which of these bottles will continue to be sold as a Heinz product. To further stake its claim, Heinz will also change its website to either www.heinzfruitketchup.com or www.heinzvegetableketchup.com. While Heinz tomato experts, chefs and lawyers have yet to come to an agreement on this issue, there’s one thing they do agree on: no one grows ketchup like Heinz. That’s because Heinz tomatoes are grown with a special blend of Heinz seeds, sustainably grown by farmers for generations and carefully selected for red-ripe quality, so that only the thickest, juiciest tomatoes make it into every bottle of thick and rich Heinz Ketchup. The Tomato Debate supports the launch of the Heinz “Grown not Made” campaign, which is now airing nationally on TV, digital and social media. The campaign celebrates the quality, care and expertise that goes into every Heinz tomato and makes the Ketchup consumers know and love. The TV spot also features the iconic glass bottle, celebrating the brand’s nearly 150-year heritage. The Kraft Heinz Company (NASDAQ:KHC) is the fifth-largest food and beverage company in the world. A globally trusted producer of delicious foods, The Kraft Heinz Company provides high quality, great taste and nutrition for all eating occasions whether at home, in restaurants or on the go. The Company's iconic brands include Kraft, Heinz, ABC, Capri Sun, Classico, Jell-O, Kool-Aid, Lunchables, MaxwellHouse, Ore-Ida, OscarMayer, Philadelphia, Planters, Plasmon, Quero,Smart Ones and Velveeta. The Kraft Heinz Company is dedicated to the sustainable health of our people, our planet and our Company. For more information, visit www.kraftheinzcompany.com.